The ServSafe® Food Safety Manager Certification program has become the industry standard in food-safety training and is accepted in almost all United States jurisdictions that require employee certification. ServSafe® Food Safety Manager Certification SafeFoodMS is approved by the Mississippi, Louisiana, and Alabama Health Departments along with the Mississippi Hospitality and Restaurant Association. 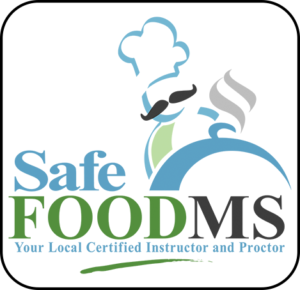 ServSafe® Food Safety Manager Certification SafeFoodMS provides training that is essential for our area and is taught by a local instructor who works closely with all the Mississippi, Alabama & Louisiana Coastal Health Departments and has 29 years teaching experience! Hire The LOCAL Gulf Coast ServSafe® Instructor! Everything you need to know about ServSafe® Food Safety Manager Certification, you will find on this site. Here you can find registration forms, class dates. You can register and pay for classes online with any credit card or PayPal. Once registration is complete, an email confirmation is sent along with study guides and two study links. ServSafe® Food Safety Manager Certification SafeFoodMS classes are held in the RETI (Real Estate Training Institute) 284 Eisenhower Drive, Biloxi, MS 39531 and The Salvation Army, Ray and Joan Kroc Corps Community Center, 575 Division St, Biloxi, MS 39530. The ServSafe® Food Safety Manager Certification SafeFoodMS classes are one day classes which includes hardcopy or online exam. Preregistration is required which can be done through this site. Ask about “same day” certification. Picayune, Gulfport, Biloxi, Ocean Springs, Pascagoula, Moss Point, Wiggins, Lucedale, Leakesville, Hattiesburg. Harrison County, Hancock County, Pearl River County, Jackson County, George County, Greene County, Forrest County, Stone County & all Gulf Coast areas in MS, LA and AL. Ask about individual proctoring and same day certification! ServSafe® Manager Onsite Classes Available!